Each of our favorite Morganite gold rings is available in a variety of gold colors, but we are partial to the rose gold versions since they enhance the pink or peach hue of the stone itself. You’re more than welcome to pick the metal color that best suits your style, but you should give the rose gold a chance. It really enhances the color of the Morganite. 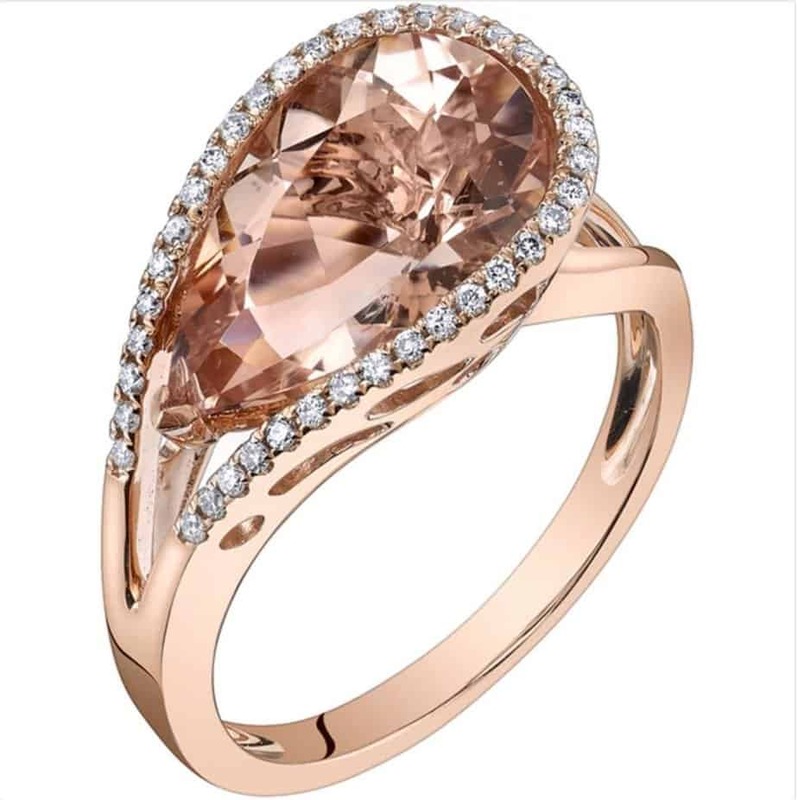 These are some great deals when it comes to Morganite gold rings, and you’ll find links below where you can buy as well. This beauty has a large, cushion cut Morganite stone surrounded by a halo of round white diamonds as well as diamonds along the shaft of the ring. The Morganite measures 7 mm and the entire ring has 1.25 carats of stones, with 37 of them being white diamonds. The round brilliant diamonds have a minimum color of J, K and L with a clarity of I2-I3. 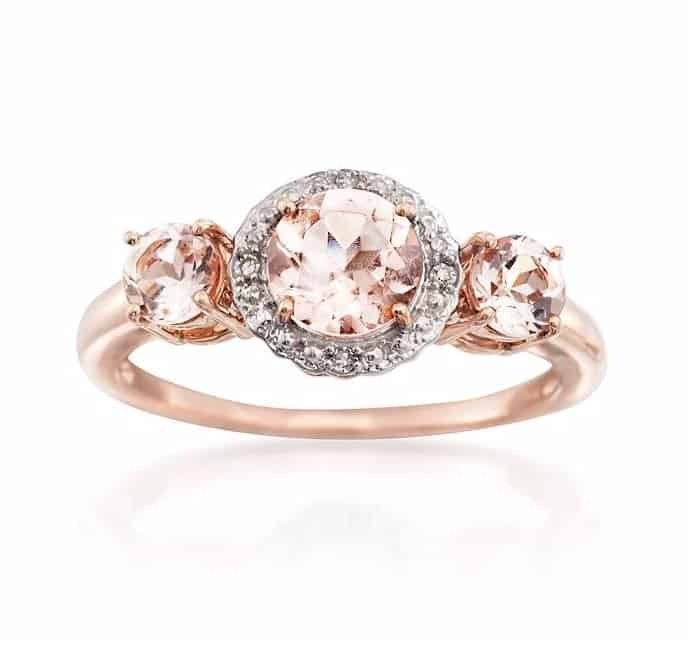 The oval Morganite is truly stunning with the double halo of diamonds surrounding it. There’s a total of 76 white diamonds on this ring with a total weight of 1 carat. It’s 2.25 mm in height and 15 mm in length. This ring isn’t for the timid and shy. It’s a beautiful statement. The 10k rose gold isn’t resizable, so you’ll need to ensure you get the right size. The 14k rose gold Morganite has a main stone measuing 6 mm, but it’s surrounded by a beautiful halo of natural white diamonds. 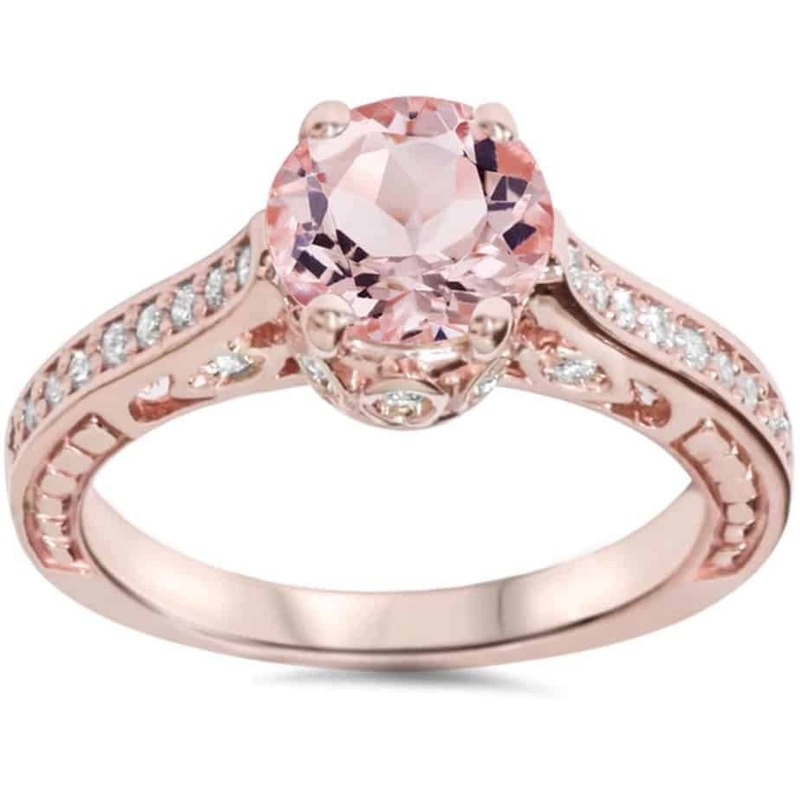 The Morganite is a light peach/pink that makes a stunning engagement ring. The natural surrounding diamonds and along the side are 0.25 carats. The diamonds on the wedding band are approximately 0.17 carats depending on ring size. Available in sizes 4 through 8.5. From the stone to the band itself, this is such a unique statement piece of jewelry. The band itself is an Art Deco design featuring vines and leaves in a wonderful filigree. The company that creates this piece of design heaven uses only recycled gold and conflict-free gemstones. It’s available in sizes 3 to 11, so it’ll fit any size finger. The Morganite is 2 carats of VS peach/pink in a stunning cut. This pink petal shade of Morganite is shaped like a flower with a round center Morganite with a surrounding pave of diamonds. The halo gives the ring the feel of a beautiful flower while the diamonds on the rose gold band look like leaves. This unique design comes in sizes 3 to 9. When it comes to a stunning engagement ring that is unique and stylish, you really couldn’t go wrong with the cushion cut checker board from Miadora. The beautiful blush pink stone will wow any woman who loves delicate pink tones. The 10k rose gold in this beautiful ring measures 1-2 mm wide while the gemstone itself measures 6 mm and the side stones are 0.036 in weight. 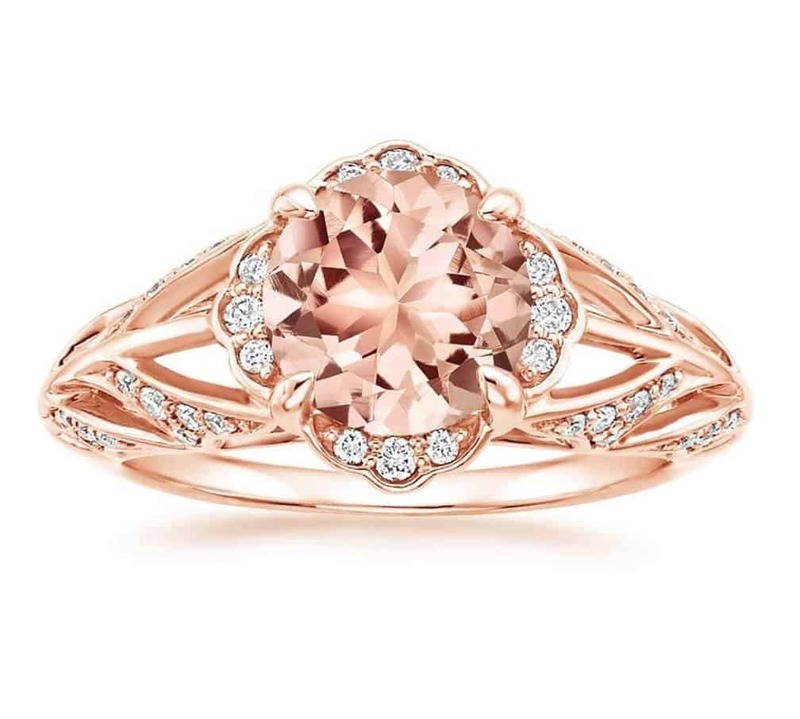 If the love of your life has a passion for vintage, she’ll love an engagement ring from Bliss with a rose shape surrounding the Morganite itself. It features a sprinkling of white diamonds under the Morganite as well as embedded in the band, too. It’s available in sizes 4 through 9. The filigree on the band is intricate and has open hearts along the band. It’s a beauty of a ring that she’ll get compliments on all the time. 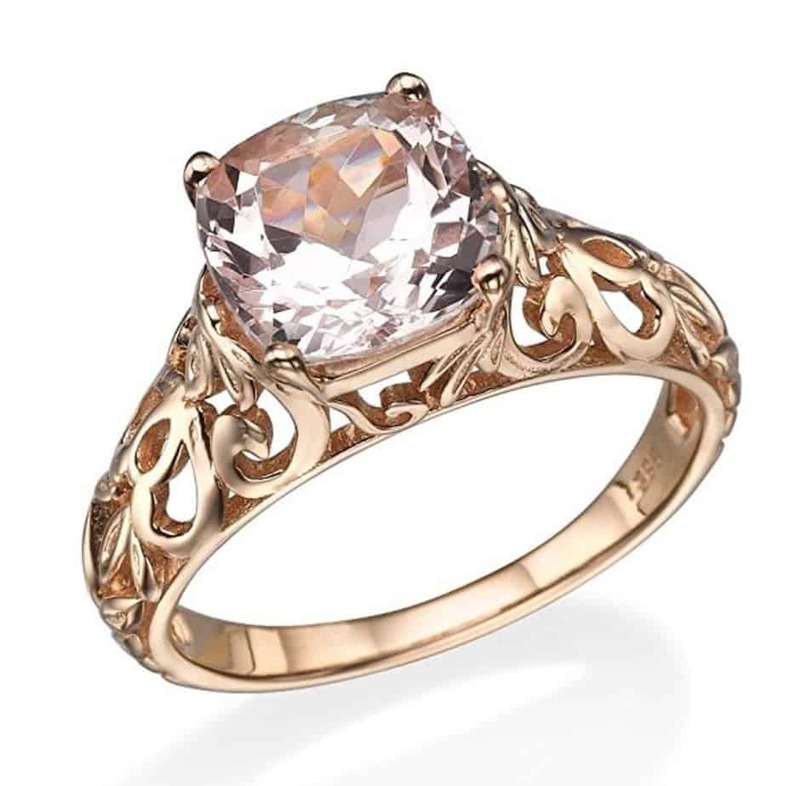 The interesting, unique Oravo cocktail ring has a stunning pear-shaped Morganite stone in an unusual setting. The Morganite is 4 1/4 carats while the surrounding white diamonds are 1/6 carat. 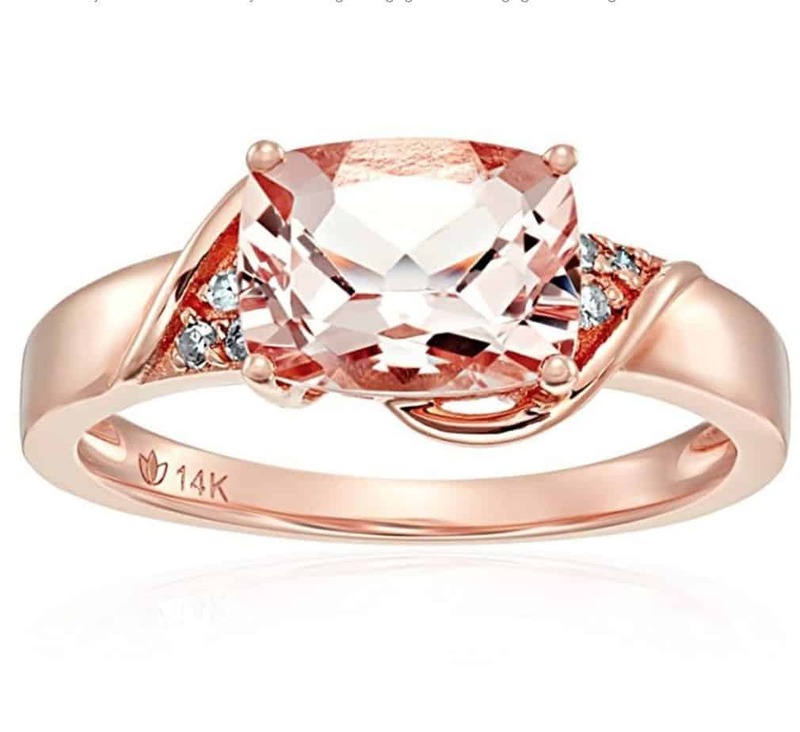 The rose gold is 14k. It’s almost guaranteed that a woman wearing this ring doesn’t have to worry about anyone else having a piece of jewelry that can beat it. All attention will be on her. 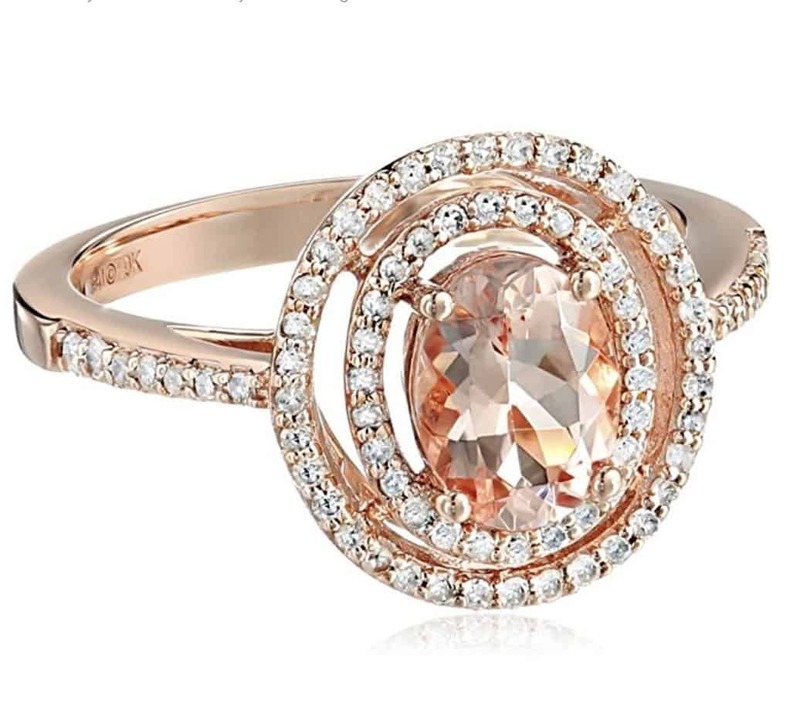 There’s a trio of Morganite gemstones in this beautiful ring. 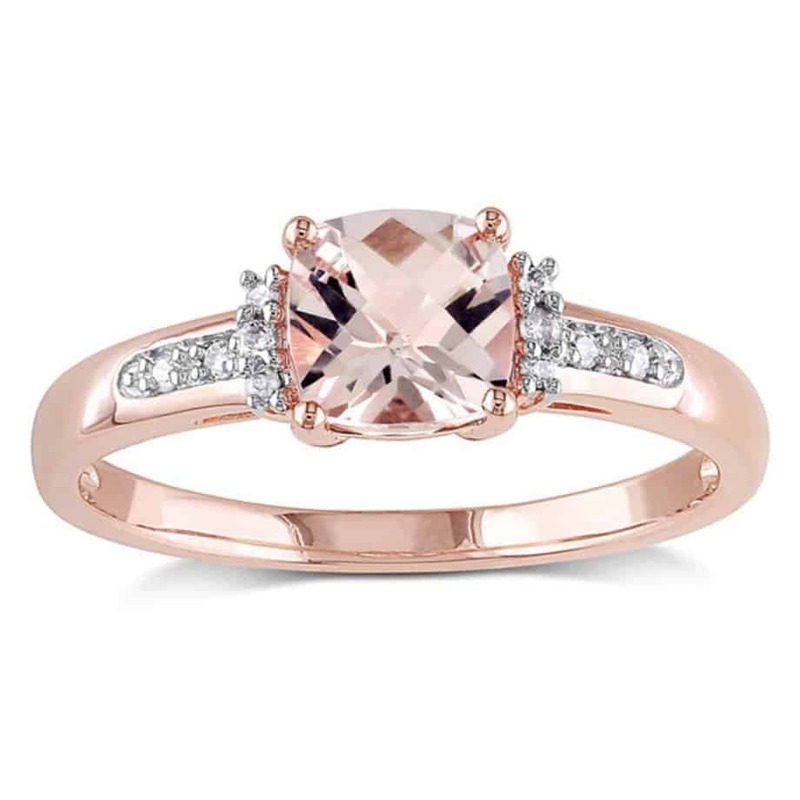 The two-tone gold comes in rose gold for the band itself with white gold added to the halo of diamonds around the main Morganite stone to give it extra pop. The entire ring is 5/16 inch in width. It’s available in sizes 5 to 10. The main Morganite is .75 carats while the side Morganite is .50 carats. 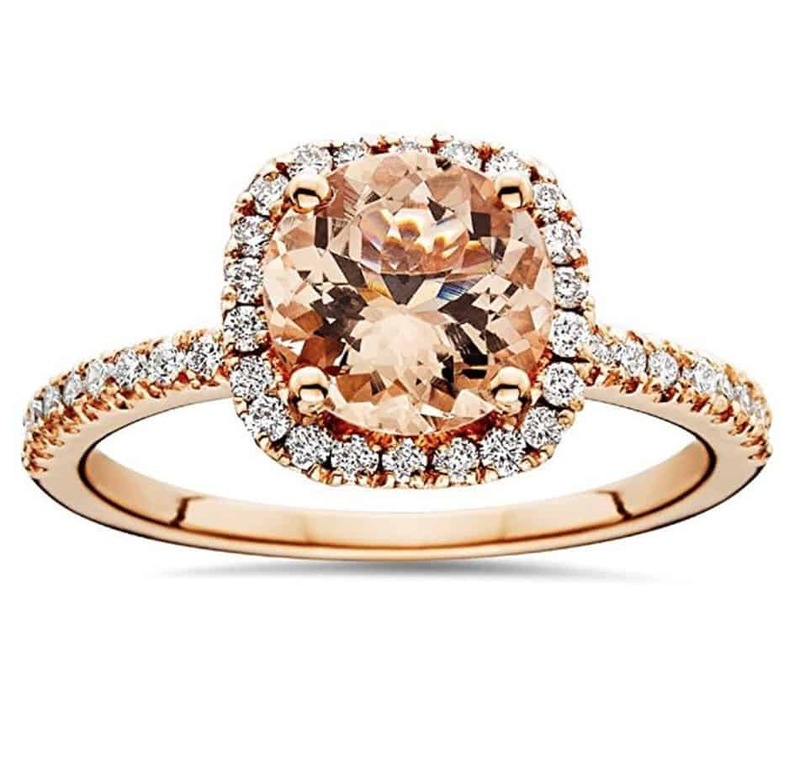 This Morganite and diamond ring has 7 stones total with one being the stunning center cushion cut Morganite. On each side of the center stone is .04 carats of round white diamonds. The total gem weight of all the stones is 1.66 carats and the metal weight is 2.41 grams. It’s available in sizes 6 to 8 and is resizable. Along with being a great engagement ring, it can be used as a special occasion ring since it’s the gemstone color for April and October. These are far and away some of our favorite Morganite rings for engagements or special occasions. If you are familiar with Morganite, and have been looking for some great deals on rings, we hope we helped you find some!